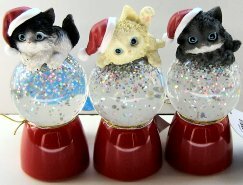 Each little kitten is sitting on a snow globe that lights up (pull tab on the bottom to activate the battery). 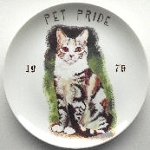 This resin and plastic decor item is 3 1/2" high x 1 3/4" in diameter. The three styles are left to right: Tuxedo, Cream, Grey Striped. Select your favorite style.